Journal des Dames et des Modes, July 15, 1810. 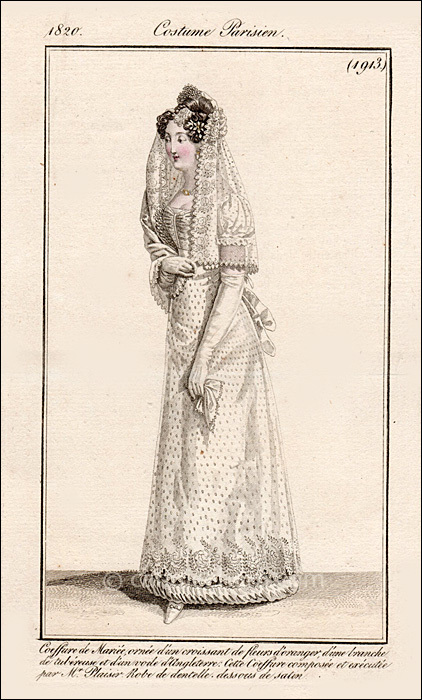 It is interesting that the veil is described as an English veil, even though none of the British prints of bridal dresses that I’ve seen of this period include any sort of veil. 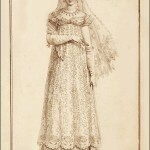 The artist and engraver (both unknown) have beautifully rendered the transparency of the veil. 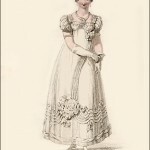 It is also interesting that the hairdresser, Monsiuer Plaisir, is mentioned, but not the dress designer. Perhaps his fashionable hairdo incorporating orange blossoms and tuberoses was the height of fashion, or perhaps he was simply famous enough to deserve a mention. 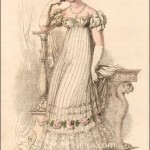 As is typical with this magazine, the print is not described, except to mention a satin overdress with an under-robe trimmed in lace. The scalloped edge of the satin dress includes a beautifully embroidered or applied floral pattern.